– Dr. Karen K. Melton Ph.D., assistant professor of child and family studies in Baylor’s Robbins College of Health and Human Sciences. ? We were ecstatic a couple of years ago when Baylor approached Painting With a Twist about a research study to determine how different family interactions caused spikes (or lulls) in the release of oxytocin. Oxytocin, AKA the “love hormone” is a hormone that plays a role in social bonding between couples. Check out a summary of some pretty interesting insights from Dr. Melton below from an interview we conducted with her! Q: How did the idea for this study come about? A: Working specifically with family studies, we really wanted to understand how different interactions affected the natural oxytocin levels of individuals participating in family activities. We chose two activities to test with participants: board games and a painting experience with Painting with a Twist. Q: What did your colleagues think when you came to them with this idea? A: They loved the idea. When we presented the idea to the National Council to receive the grant for the study, they loved the idea as well and were excited to hear the findings. A: We hypothesized that all activities would release oxytocin but that board games would likely release more. What surprised us the most was that not only did painting release MORE oxytocin but men in the painting group had 2-2.5 times the oxytocin levels of other groups (even other women!) What’s interesting too is that people who were in the painting group had higher levels of oxytocin at their baseline than board game participants leading us to the idea that the novelty of the concept and physical environment play a key role in the release of oxytocin as well. Q: What was your personal experience at Painting with a Twist? A: When we had the idea of the study, I took my team for the experience and everyone really enjoyed it. I still have my painting in my bedroom because I’m so proud of it. What I think is really great about the concept is it takes away a lot of the work when it comes to family leisure. Somebody in the relationship has to do the work of setting up the activity. With this, it’s all done for you so you can enjoy a true state of leisure. And when it comes to the actual activity of painting, you are challenged but certainly not overwhelmed. Q: Are you looking forward to returning to Painting with a Twist? A: Absolutely! I think it’s a great concept. I’ve seen some kid-friendly options posted so I’m looking forward to taking my daughter for mother/daughter date night. Q: What do you hope comes about based on your study results? A: Well, we certainly know more than we did before the study. We can make a lot of assumptions with recreational activities but it’s great to be able to measure the true experience. Ultimately, we would like to study different types of interaction to find out exactly what activities and factors release oxytocin. This information can help facilitate better experiences and family interaction so individuals and couples can connect at a deeper level. There you have it! Painting = more oxytocin = more love in the air. 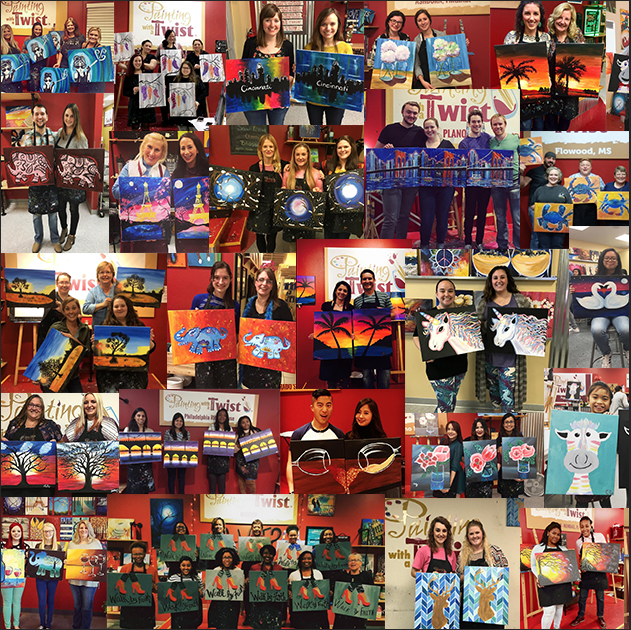 So if you’re planning your next date night, find a Painting with a Twist studio near you and give it a whirl! You might walk away with not only amazing paintings but a new sense of connection with your significant other. Cheers! 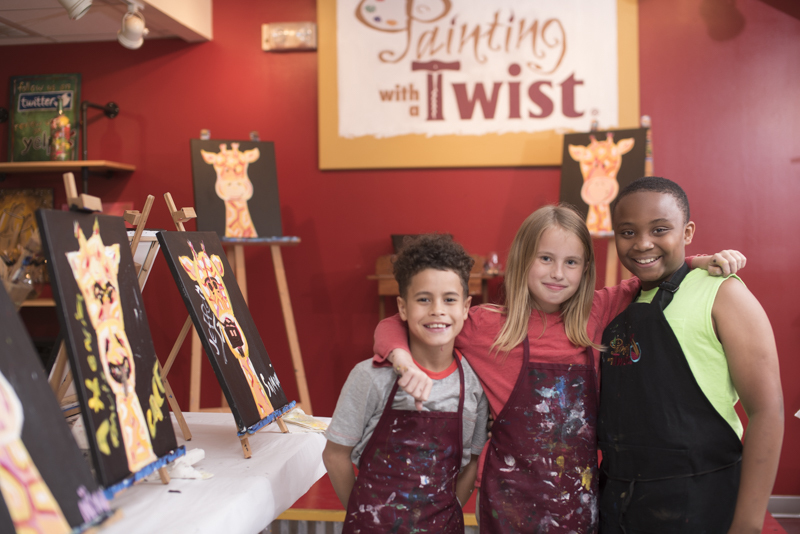 Painting with a Twist studios* nationwide offer an outstanding and innovative way for parents to get their day back with our Summer Kids Camps and Kids Classes! Kids camps and kids classes are an invigorating option to get kids out of the house and interested in something beyond computers and video games. They can explore their wild side with creative guidance and enjoy painting in a fun studio atmosphere – all while meeting new friends! Keep them busy and keep them INSPIRED! Hanging their painting up at home will also help boost your child’s confidence! The look of pride and satisfaction on their face after each class is absolutely priceless. Creativity opens up their perspective to future possibilities and keeps their minds active during the summer months. Give them the tools for success by enrolling them in Kids Camp or Kids Classes today! 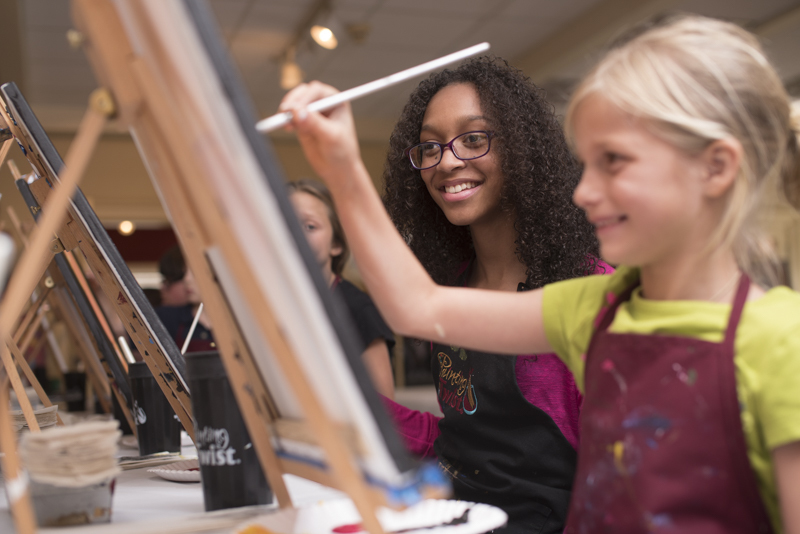 Happiness abounds at Painting with a Twist Kids Camp! It’s About the Time, Not the Art! We provide them with everything they need to have the best time possible: Dancing, snacks, friends, playtime, art, and more! Find a Kids Camp near you by clicking here! Making New Friends at Painting with a Twist Kids Camp! Julia Child hit the nail on the head when she said, “A party without a cake is just a meeting.” Don’t stop at cake! 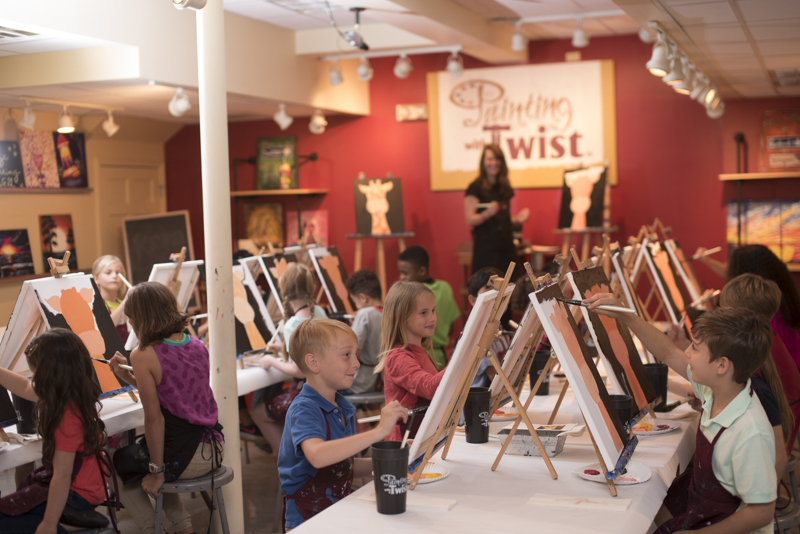 We invite you to bring an array of treats when you host a party at Painting with a Twist. You can ask your party guests to bring a potluck dish or plan to have the entire event catered with your favorite snacks. 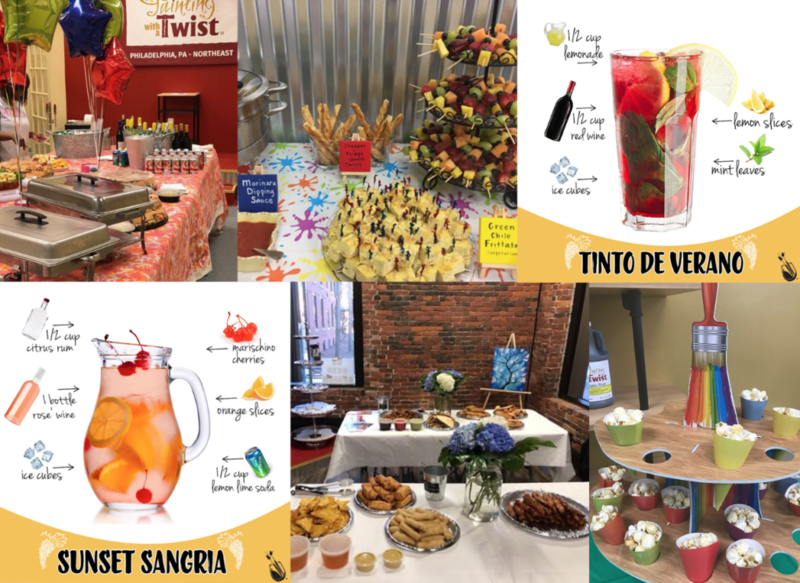 Most of our studios are BYOB, so don’t forget to pack some shareable cocktail options, like the makings for a fruity Sunset Sangria or sippable Tinto de Verano. Some locations even have a bar inside the studio for all your cocktail needs. Mustache Contests, Dance Parties, Karaoke, and Selfie Ops! Contact your local studio for information about hosting your own private event, or fill out our party request form. It’s date night again and you’ve got a standard lineup of ideas circulating in the conversation- Cocktails? Dinner? A movie? Date nights are there to help us reconnect. We want to feel that spark of excitement in our romantic relationships. We want to indulge in experiences that we can happily reflect on and tell stories about later. So why do we stay in the same redundant pattern? 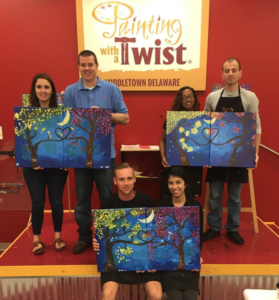 Albert Einstein once said, “Creativity is intelligence having fun!” Change it up every once in awhile and do date night the smart way: Painting with a Twist! 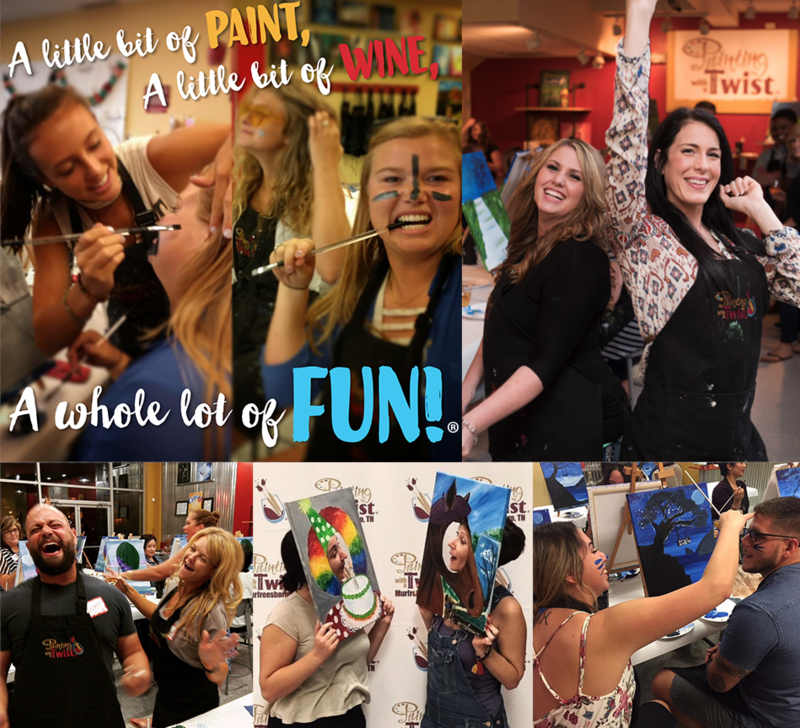 According to Bustle, couples who attend paint and sip classes together are less likely to break up. With all the fun and diverse options, there’s no reason to pass up the chance for bonding with your bae. Here are 5 ideas to help you spice up your date night with Painting with a Twist. If you and your boo are animal-obsessed, then this is the fun and interactive class for you. It’s what your walls having been missing. Send your local studio pics of your beloved pet and let an upbeat instructor lead you on a step-by-step creative journey painting a portrait fit for kings! 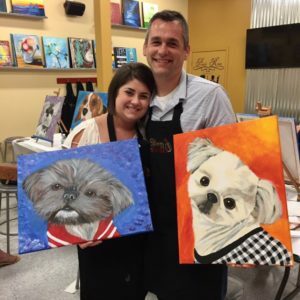 Below is a dose of puppy love brought to you by Painting with a Twist in Mobile, AL. Bonus: Get ready to swap heartwarming + hilarious stories about your furbaby with everyone else in the class. Ghouls and boys unite for this spooky class! 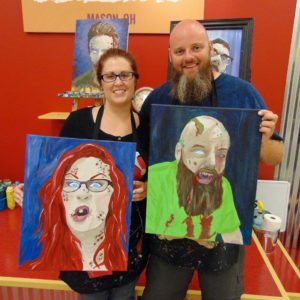 You and your date will paint portraits where you “Zombify” yourselves in every creative and icky way imaginable. It is so fun – we’re dead serious. These two twisters from Painting with a Twist in Mason, OH did a creepily amazing job “Zombify-ing” themselves! Bonus: Dress up as zombies when you attend the class- you can even make zombie themed refreshments! Who knows, maybe there will be a costume contest?! If anyone has trouble getting their guy through the doors of a paint and sip studio, then this is bound to solve that. Ladies and Gentlemen… Introducing… Game night! Sometimes our studios partner with local teams for a truly exclusive experience celebrating your favorite team. 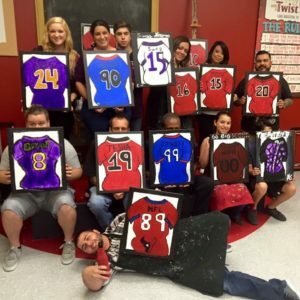 Other times, studios host “Paint Your Own Jersey” nights where you get to paint your team’s colors while going head to head in friendly smack talk amongst rival fans. 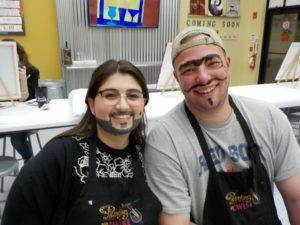 Join the winner’s circle like these guys n’ gals at Painting with a Twist Kingwood in Houston, TX. Bonus: Amp up date night by sporting your favorite team’s gear and bringing a cooler of tailgating goodies! Many of our paintings are made to do side-by-side with someone. Combine your skills (and paintings) to make one big piece of art to hang up. Every time you see the painting, you’ll remember what a wild time the two of you had. Imagine it now: Scrunched close together on your stools. Cocktails in one hand and paintbrush in the other. Then, the announcement of a mustache contest… Get ready to LOL and make some date night memories! Bonus: Make it a friendly challenge of who’s painting looks better! Winner gets a kiss and bragging rights. Tis the season, y’all! 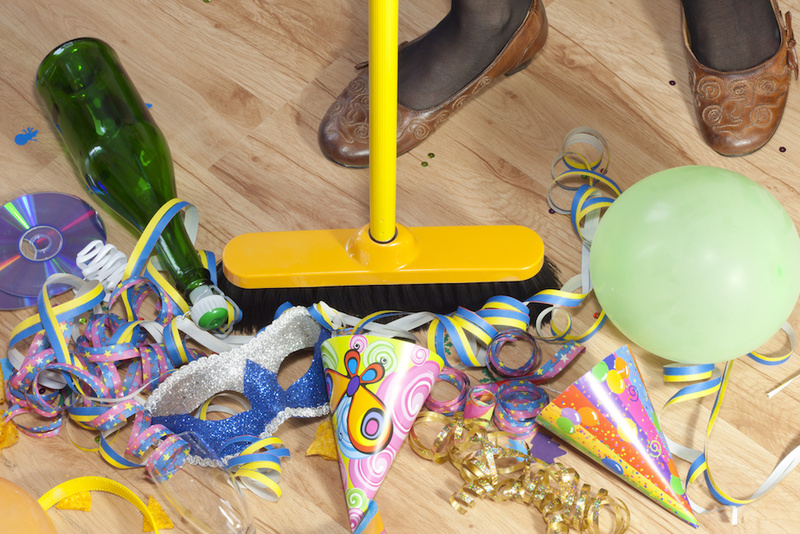 Winter is right around the corner and that means the holiday-themed parties are here. Whether you’re attending a public class or hosting a private party, bring a batch of mulled wine and sugar cookies to your holiday date night. 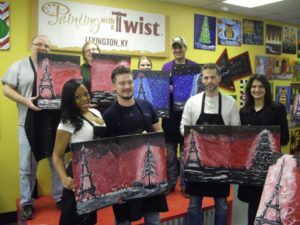 Can you feel the holiday cheer coming at you from Painting with a Twist in Lexington, KY?